i’ve been thinking a lot about the whole concept of blogging, wondering exactly what it is i’m doing here and what i would like to accomplish. some of my goals center around networking, others are related to honing my writing skills (obviously needed!). partly this will be a journal for myself, partly it will keep my friends and family posted on the happenings of our lives. i have noticed that my first posts, and just the general layout and vibe of the blog so far has been feeling like a refuge, a clean and baggage-free hangout spot for me to allow me to be myself in. i haven’t clued too many people in to this blog’s existence yet, but as that is the plan, and as it’s searchable on google, i guess i have been thinking of these first few posts as ones with which i can set the tone… decide how i want this to come across to people. still, if i’m being me, isn’t “setting the tone” superficial? i want to be real, but i also want to use this spot as a place for positivity and maintain that refuge feeling. i’m not saying there won’t be any negativity, or real life issues or concerns, there will certainly be some i’m sure. i guess the bent towards positivity IS me and IS the place i’m in right now in life, so perhaps it doesn’t mean i’m being artificial at all… actually i think i’m making my peace with setting the tone- it’s another form of mindfulness, the purpose of which is to be as true to my own integrity as possible- to represent to those around me who i really am on the inside, is much more honest and far from superficial. ok, i’ve talked myself into it, as you can see. but just so you know, the posts won’t all be proclaiming the abundance of the universe and the glories of the self-designed unschooling curriculum. you’ll certainly be hearing some redundancy about things like glorious trips to the beach and fresh organic local food, but also the real life grungies and foosies (pronounced “FUH-see”; ask my mom). there is dirt under my nails and a layer of detritus on the floor of my car. it’s part of the price one pays for living the natural life as fully as one can. 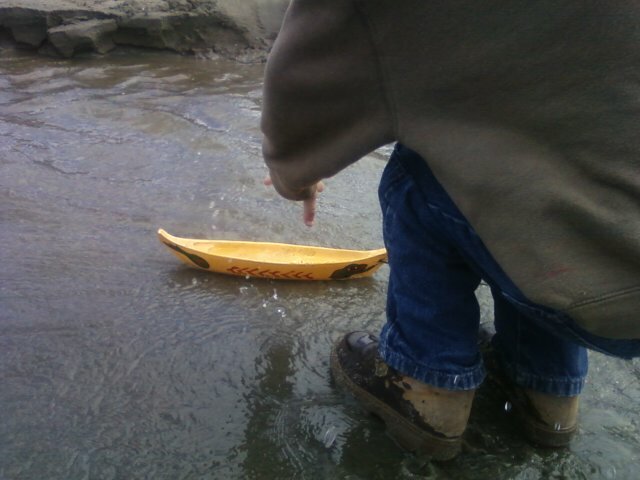 as with all things in an unschooling life, everything Q is learning is intricately woven together, so what he is reading is always at least marginally related to everything else he has going on- he is always talking/pretending/thinking/acting/playing “boats”, tying knots, and of course the rhythmic language of these captivating stories has influenced him heavily. however, currently, one of quinn’s challenges with language is figuring out the right times to use expletive words for emphasis. oohhhhh boy, have we had some potentially embarrassing moments! i’ve been taking the course of trying to share with him when i use these words, when they might offend other people, that i don’t wish to offend anyone, just express the strength of the feeling i’m having, and so i avoid using those words when someone around might get their feelings hurt by it. and generally help him learn awareness of all of those subtleties of when it’s appropriate to drop an f-bomb. still, the f-bomb in particular is a fascinating word, and he is obviously quite taken with the power he holds when using it. two or three times now i have listened to him inserting f-bombs before each and every noun in a long quoted passage of mokie and bik. i feel like it’s a lesson for me in unschooling, yet again. he needs to be free to explore the limits on his own. he may be testing out the f-bomb as his all-purpose modifier, but i don’t think he will ultimately adopt it for that role. there are far too many words with interesting and subtly different meanings, to want to reduce the texture of one’s speech to constant overemphasis. he is also slinging around words like “perhaps” and “actually”, and turning beautiful phrases like “my fingers turned and dipped, and plucked the egg out of the water!” (this was from retrieving a hardboiled egg out of a bowl where it was cooling…. so poetic!) if not, i might be more concerned. honestly, it has been an opportunity for me to look inward at my own hangups and beliefs about “foul language”, and investigate where my reactions (and over-reactions!) come from, and whether those feel true to who i am and who i want to be as a parent. That is so funny!! (the fbomb! 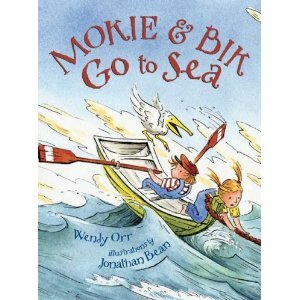 )I am really enjoying reading your blog and getting little glimpses into your life.Q is one lucky guy!Moki and Bik looks like a great book..where did you find them? Ah, so many good thoughts here. First of all, we also love Mokie & Bik. I was honored beyond belief when Wendy Orr once left a comment on my blog! He stories are so sweet! As for the f-bomb… I will give you a little perspective that has helped our family. My parents were not native English speakers, so I was allowed to swear all I wanted and they did too. In English. When I figured out and used Spanish swear words… LOOK OUT! It's just a word, a group of sounds. So to them the English ones were not offiensive (all my friends LOVED coming over and test driving their foul language at our place) but the Spanish ones were very offensive. I have shared this with my son, and we have played with the idea. What if somebody decided bumblebee was a bad word. Or make up a word and talk about it. I tell him that WORDS ARE NOT BAD. Words are beautiful! Intentions can be bad, words can not. If you say SH*T because you really hurt yourself, you are not bad and neither is the word. There may be a BETTER word to choose, or not. But if you call someone a piece of SH*T that is a bad intention, and that's where we call foul. I talk to him about perceptions and how you speak tells others about your character. Using improper grammer or "bad words" sends a message to the world about you. What do you want your message to be?